This week marks the 8th week in Transformation.com’s 8 Week Super Summer Challenge. 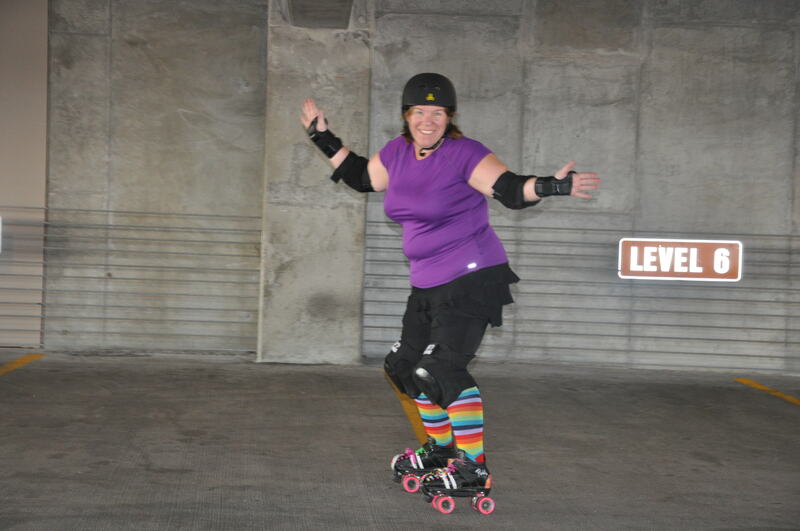 I had a few goals set for this challenge…..
Last night, my hubby and I made a little visit to the 8th Street Parking Garage with my skates! I felt all sneaky like. A part of me KNEW that this couldn’t be allowed in the parking garages, but my friends had done it before and didn’t mention getting busted. But either way, I wasn’t gonna take the chance. 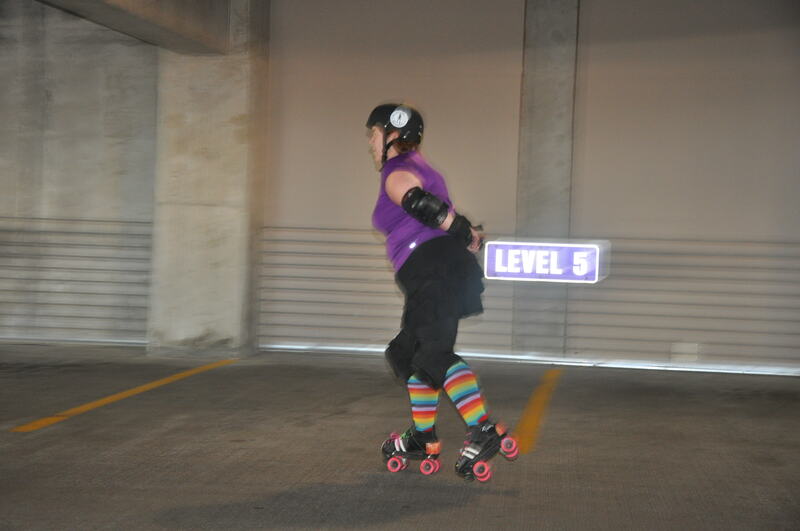 So We went up to level 2 where the parking starts to get my skates on. *laugh* I didn’t want the attendants to see me rolling in through the gates *laugh* Anyway, I skated up there. I am not certain what preconceived notions I had of this adventure, but I thought I would KILL me. I thought it would be harder than heck! Yes, there were parts that were hard. Every level had an up ramp and then a semi flat part. So my legs had a bit of a rest at every level. One thing I did notice was that the cement was grippy and hard to push on..especially going up the up ramps! By the time I got to the top of every up ramp, my legs were noodles! 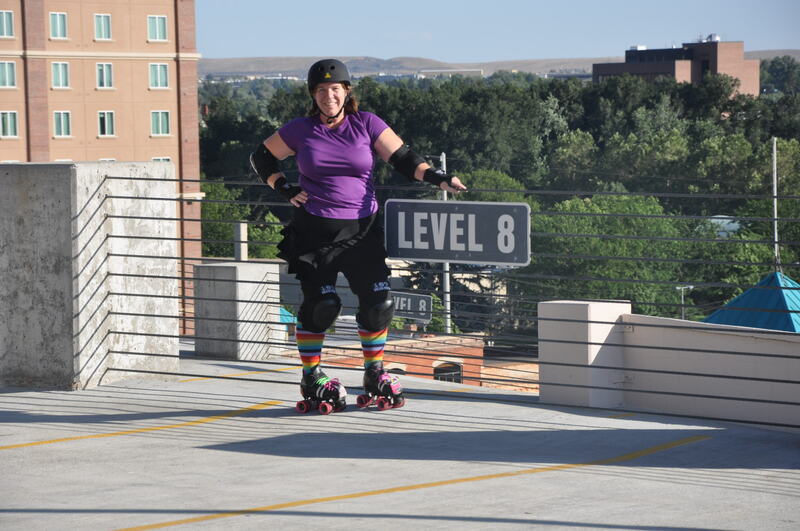 I was very grateful when I got to level 4 and the cars thinned out and I had the place to myself for the remainder of my skate..which made it that much more enjoyable! Skating is always worth smiling about! Contemplation, alone time, pushing hard up hill! I had not planned on coasting down. I thought that would certainly kill me! But once we got to the top and took some pictures, I thought…”Why not! At least on the empty levels!” So I started down on the “flat” part of the level and realized the “flat part” wasn’t so flat and I was already catching some speed. The steep parts might be a bit intense. I turned the corner to go down my first steep part, when I heard my husband yell from the car….”CAR!! !” I looked up and stopped. 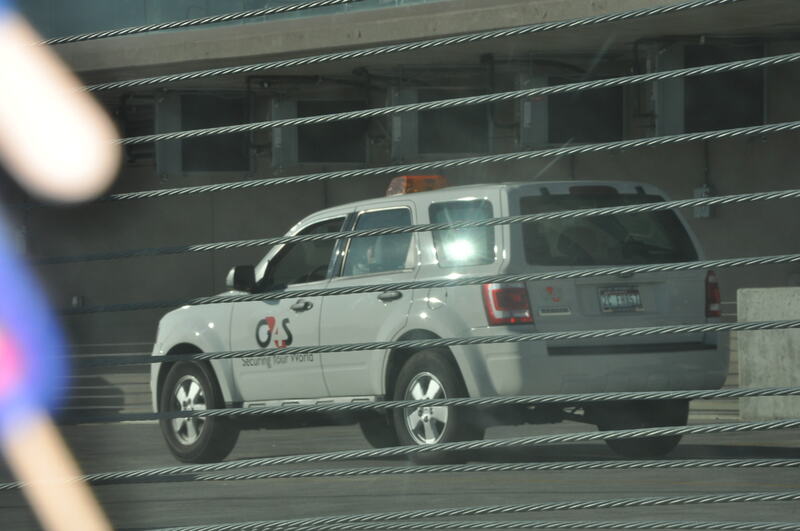 It wasn’t just any car, it was security! BUSTED!!!!!! 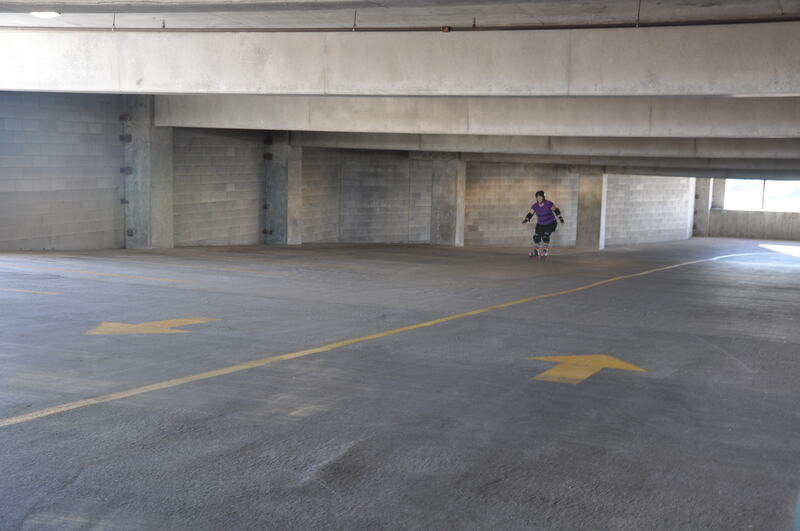 “Ma’am, you can’t skate in the parking garages.” He said with a smile and amused look in his eyes. They were all smiles and very sweet. I think they were expecting to find a rowdy mouthy teenagers and were shocked to find a 42 year old woman! *laugh* It was fun..and boy did I feel like the rebellious teenager they were expecting! Ha! It’s good for the soul! One more goal down…….a few more to go! Last night I went to bed early. I knew it would be a cool morning and I wanted to get up and out early for my run. So this morning, I woke up and I could feel it! Today was going to be the day! I put on my running shoes, got my Nike+ Ap running and hit the pavement. My knees were trying to tell me otherwise. My back was trying to tell me I was crazy. My lungs were NOT happy. And my mind wanted to play games with me! I just told them all to be quiet..we were gonna do this today!!!! So I ran…and walked…and ran some more. I didn’t use my formal 4 min run 2 min walk training, but I was close. My running was faster, my form (thanks to Chi Running) is getting better. But I’m still running too fast for my lungs. Gotta work on that. Anyway… I did it! 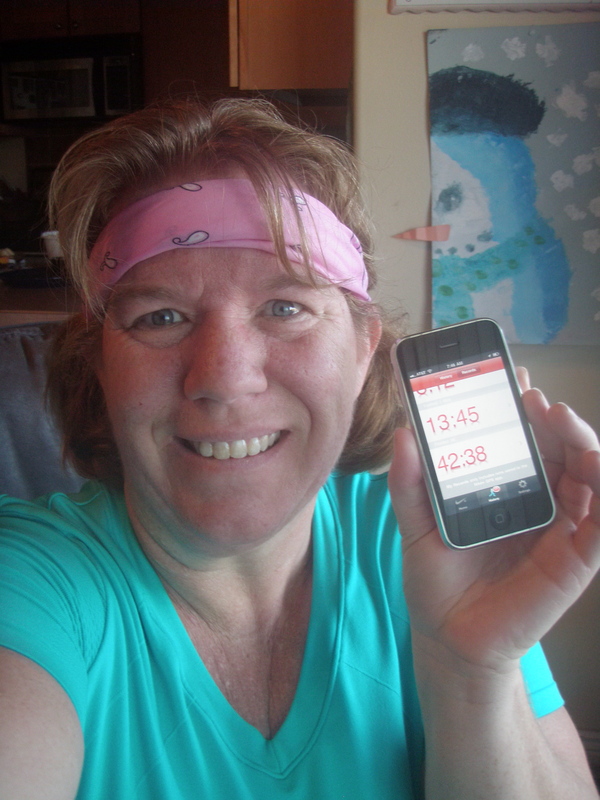 My original goal was faster than the 45 minute pace I had been running for my 1/2 marathon training. Then I had the crazy goal of 43 minutes today. A goal is no good unless it is specific..faster just wouldn’t do. I needed a specific time! So I set what felt like an impossible goal to reach..shaving off 2 minutes of my time in a week? Seriously? Well ya know what? You are more than you ever imagined you can be!!!! You are a limitless being of the Divine Creator. AND SO AM I!!!! Today, I finished my 5K in 42:38!!!!!!!! So there ya have it….2 more goals checked off the list! I will get to Eagle Skate Park sometime this week to re-run laps and see where I am :). What goals are you reaching for???? Thoughts on turning 41 and living Fearlessly! On May 7th, 2010, I turned 41 years old! It was a party; as a matter of fact, I partied for about 2 weeks! I absolutely adore my life and celebrate it every day! And this last year has been one of the best years ever! When I was approaching 40, I thought, “I’m gonna lose enough weight to jump out of a perfectly good airplane for my 40th birthday.” It didn’t happen. Instead I started my birthday out right with a birthday party filled with laughter. I had a laughter fitness instructor deliver a laugh o gram, and my whole party joined in the laughter. We wore silly hats and had a great time! My husband and my best friend bought me a ride in a Nascar Race Car on the Las Vegas Speedway. I got in the car with a professional racer and went around the track at 245mph! I was excited and scared all at the same time, and when the car started moving all of that fear went away. It was fabulous! I loved it! And while we were in Vegas we saw Jimmy Buffett and partied all weekend. It was awesome! It was a great way to start off my year. So between my 40th birthday and my 41st birthday, life has changed dramatically. Until just before my 40th birthday, I hardly ever laughed. Now I laugh all of the time. I smile all of the time. I actually feel JOYFUL 98% of the time! I know this because in 3 weeks, in 3 different settings I have had people come up to me and tell me that I am radiating love or happiness. The first time this happened was right after my husband and I joined our church. One of the church members came up to me at the end, and said, ‘I just had to hug you because you radiated love from up there on the podium.” Then the next week at a Tropical Cowboys show, the drummer came up to me to give me a hug and told me the same thing, “I see you all the way back here radiating love.” Then just last weekend, on our way through the security line at the Boise airport (on our way to Vegas again) a TSA lady came up to us and stopped us. “Where are you going? I just know it has to be some place fun, because I have never seen people rush up to the security line with such smiles on their faces!” We told her we were going to Vegas. And she said, “I have never seen 2 people so happy!” Funny thing is, we weren’t near as excited and boisterous this year as we were last year heading to Vegas. *laugh* It’s just that I have changed so much! So what happened???? To say I really don’t know would be a stretch I guess. But I can’t tell you one specific thing that has changed. It is just a matter of things accumulating I think. 1) I learned to laugh and not take myself so seriously! 4) I have lost weight (not the amount I had always strived for) and I have gained some back, AND I am happy with who I am!!! As long as I FEEL good that is all that matters! 5) I take risks!!!! If I am scared of something, I make myself do it! I don’t let fear keep me down! I started living FEARLESSLY! 6) I KNOW & TRUST that my highest good is always being taken care of….worrying is wasted energy. 7) I am growing spiritually and intellectually through all of this reading I am doing. 8) I have learned to say “No” and “Yes” at the appropriate times! 10) This is my favorite..jsut the other day, when one of my class mates was asked, “What part of God do you see in Martha?” her response was “Authenticity” When we moved to Idaho, it was my goal to live openly and be authentic with who I am….And her reply was exactly what I needed to hear to know that I am living my life the way I have always dreamed of living it! Sure I have challenges. Sure I would still love to be a lesser physical weight. Sure I would love other things to change. However, I LOVE MY LIFE NOW! In this moment, right where I am, I LOVE IT! I have one of the best marriages I have ever seen. I have 3 beautiful loving strong children and one just as beautiful loving and strong daughter in law! I have volunteer work that fulfills me. I have a job that keeps me active and encourages me to be better. I belong to the perfect church for my life and it is filled with so much love it is palpable! I am making new friends who love me for me! It’s perfect! And for my 41st birthday, that same friend who helped with the race car ride, bought me my roller derby gear. Ever since I was a little girl, I have wanted to be in the Roller Derby. 3 years ago when Boise got its Roller Derby League, I told my hubby that is what I wanted to do. And every year since, when I start seeing their advertising, I say the same thing. “I want to do that!” Well, yesterday was my first practice as Fresh Meat for the Treasure Valley Roller Girls. I was scared. Here I am..41 years old, well over 200#…and just started roller skating again after not skating for over 10 years! I put on my shiny new speed skates, and pads and got out on that track! I was scared to fall; what if I looked stupid? What if I couldn’t get up? What if it was all too much for me? What if I am too out of shape? To heck with the “what ifs” Just get out there!!!! So I did. When it came time for practicing our falls, my new friend Crash told me “you have great knee pads, just trust your gear and trust yourself.” I did. And guess what? I didn’t get hurt! When it came time for endurance practice, they cheered me on! When it came time for weaving drills, they cheered me on! I was told, “You have great skills to build on!” “You are a natural” “You must have been raised on skates.” And when it came time for backwards skating, I blew them all away. Even the non-fresh meats. I skated circles around them. “Wow! Look at Martha go!” I’m not gonna lie, that felt damn good! I was exactly where I needed to be. It was the perfect fit for me. The only sport I have ever felt comfortable in was a sport that included roller skates! There are sooo many lessons to be gleaned from yesterday’s Fresh Meat practice. Living fearlessly: Fear is there to keep you safe, but if you are already safe, it is just a hinderance; it’s a lie! Taking risks is how we grow! It’s a must! Learning to trust ourselves and trust “our gear”. Let go and trust God. We will never know how great we are at something unless we give it a try! We will never know the joy of accomplishment if we don’t take that first step! On mother’s day this year (which was 2 days after my birthday) my kids gave me this huge card that had this granny woman doing the splits on the cement. When you opened up it played one of my favorite disco songs. (My kids know me so well.) But what they wrote inside of it was so touching. My 17-year-old son told me he was proud of everything I have accomplished this year and encouraged me to keep it up. My 10-year-old daughter told me basically the same thing. That is such an amazing feeling. They see all the changes I have made in my life this year. They recognize this brighter side of me. I know I am setting a great example for them. I know what I am doing is right! If you are sitting back in that comfortable space of fear. If you are afraid to take risks and would rather live a “safe” life, then I challenge you to make some changes. Take a step outside of that box you have built for yourself. Get out there and enjoy this life. We are here to experience it and live it..not to watch it float on by us like a parade! Get up and join the parade! Dance with the clowns! Play those blaring horns! Maybe even do some juggling. And remember, even in a parade, there are people who have to pick up the horse manure! It’s not always going to be fun and games, but it is always worth the risk!!!!! I’m in the front left hand row with the white shirt. 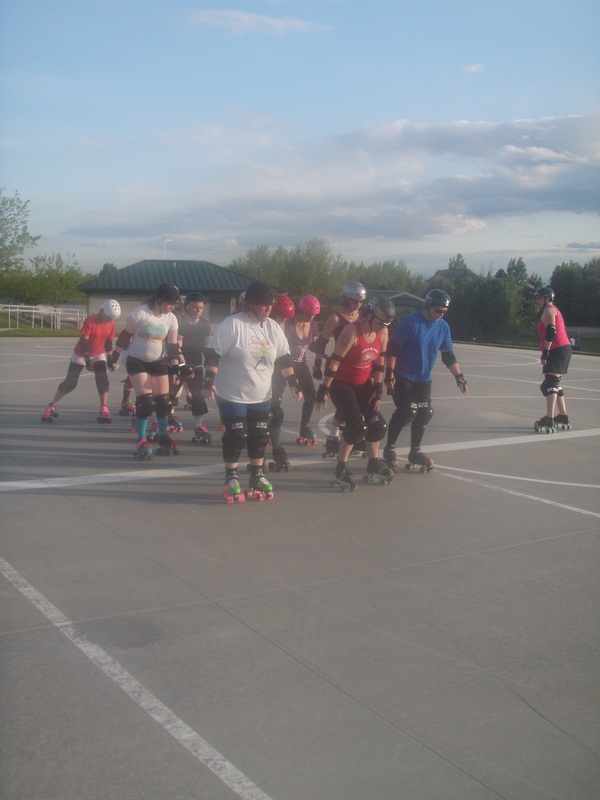 This is at my first Treasure Valley Roller Girls Fresh Meat Practice…learning to skate in a pack and listen for verbal ques and directions. So much fun!